Anything said here will undoubtedly be unintelligible against the din of praise for Manchester by the Sea. Although it’s tempting to be a dissenting voice, if only to be heard, this review is wholeheartedly laudatory. Amazon Studio’s indie release was nothing short of refreshing. And those who cringe at the juxtaposition of “indie” and “Amazon Studios” need look no further than Manchester’s competition: a dynamic Disney duo of Rogue One and Moana. Meanwhile, La La Land dangles tantalizing song-and-dance routines, ones performed by none other than superstars Emma Stone and Ryan Gosling. Who doesn’t love an underdog though? It’s in this vein that one would rather cheer for the real Casey Affleck than a contrived Ryan Gosling. Sure, the younger Affleck has been kicking around the periphery of Hollywood for some time now, but always in eddies, never quite the mainstream; it’s his older brother that made theirs a household name. But after seeing Manchester, it’s hard to imagine a better front man for the role. Maybe it’s the years he spent on the sidelines that, somewhat paradoxically, made him just the man to play Lee Chandler, Manchester’s reticent protagonist. Lee Chandler (Casey Affleck) haunts the insular, titular Massachusetts town. At times he seems more prop than person, just another shade of gray in the New England winter. Suffice it to say, he doesn’t want to be there; it was tragedy that drove him away to Boston, and only tragedy could bring him back. His older brother, Joe (Kyle Chandler), by all accounts an upstanding member of the community, succumbs at last to a degenerative heart condition, entrusting his teenage son’s care to Lee. This charge comes as a shock to the boy’s husk of an uncle. Lee has avoided Manchester like the plague, and what he anticipates will be a painful day or two of death-in-the-family-related errands bleeds into months holed up in his brother’s home. 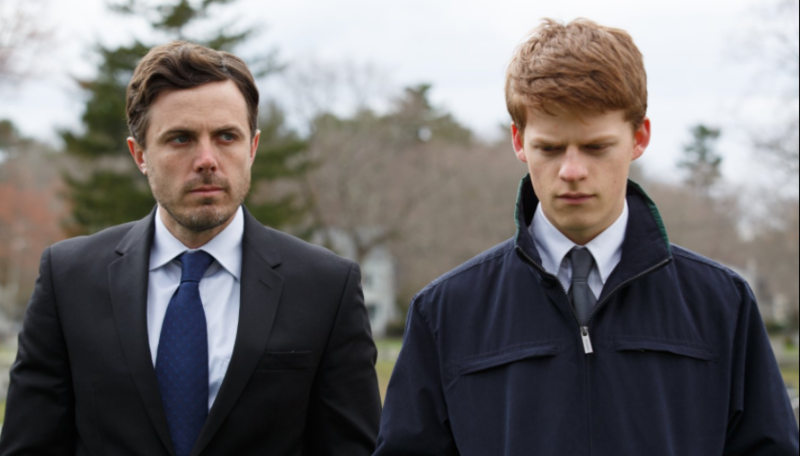 Patrick (Lucas Hedges), Lee’s nephew, is the most colorful member of the bereaved family; his youth and wit are a welcome respite from his uncle’s frigidity, a frigidity that smothers the seaside town like a pall. The creases of this pall divulge themselves as flashbacks, Lee’s recollection of a time come, gone, and never to return. As his memories unfold, Lee’s manner becomes recognizable as the brand of melancholy that accompanies irredeemable loss. As Patrick’s guardian, Lee has a shot at some semblance of redemption. The specifics of the story are as unique as the themes are universal. Everyone struggles to right their wrongs, to grapple with death, and to find their place in eccentric families. As relatable as the film might be, it still isn’t for everyone. Lee’s taciturn affect is, at times, frustratingly reminiscent of Gosling’s character’s in Drive: there’s hardly any dialogue. More importantly, Manchester by the Sea isn’t by any stretch of the imagination a “happy” movie. A joke about death is, after all, a joke about death. So while Patrick’s sarcastic remarks on our absurd approach to death (endless forms, funerary homes, etc) are utterly necessary as a means of comedic relief, they are short lived, and the audience is promptly cast straight back into the icy waters of Manchester, Mass. That said, each supporting role is robustly fulfilled. Michelle Williams manages to deliver a heart-wrenching performance in the few minutes she’s on screen, while C.J. Wilson plays the part of steadfast family friend like a fiddle. But it’s Affleck’s understated performance, coupled with director Kenneth Lonergan’s masterful writing and direction, that yield a film worthy of the glowing praise it’s received. Lonergan has managed to create a tragedy of nearly unimaginable proportion, punctuated with humor, and tethered by the realities facing every family, dysfunctional or not. In short, it’s well worth watching.